Every year around christmas I tell myself that next year I will have electronic christmas decorations, and as next year arrive it’s forgotten until it’s to late. A combination of STM32F030 and ULN2003 is excellent for a very small x-mas tree PCB with blinking LEDS and home made tree lights. In fact I have done this circuit before as a PWM driver with a single ULN2003, so what I will do is to make multiple PCB’s with LED strings connected through a RS-X (12V + RS485). These can then be wired in the x-mas tree and controlled by RS485 connection and 12V LED driver. STM32F030F4 is excellent for this purpose, it cost 0.4 USD from AliExpress and all I need are sufficient to cover 20-40 of these. A 5A LED Driver should be more than sufficient. We make a harness with connectors up the tree where each decoration connect to this is a star network. Application can be constant or random patterns as a start to make it simple. In fact I could make a small ESP32 control system with RS485 at bottom so I get the entire c-mas tree on Wifi or bluetooth. This could be a lot of fun. The cost of this will be 2-4.- USD per PCB, around 10.- for the control system and a bit for the wiring. I probably end up spending around 100.- USD for a very attractive x-mas tree light system. 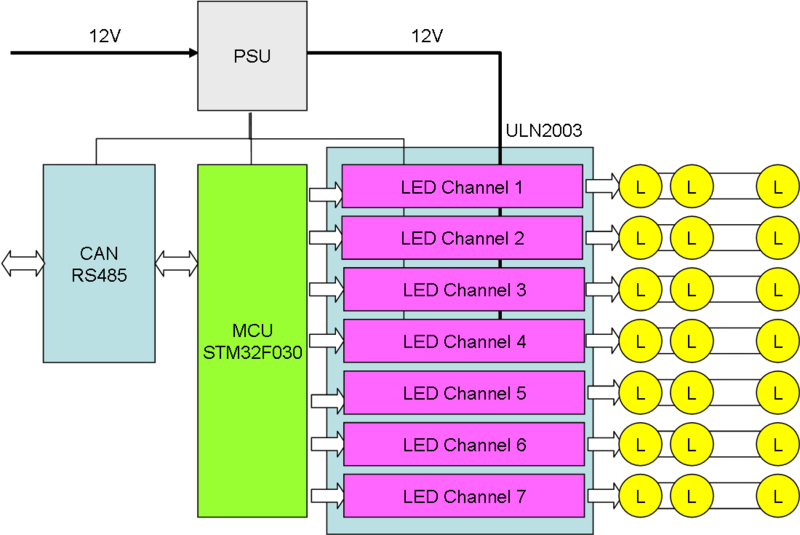 I can probably use up to 200mA per ULN2003 and a quick calc is that a single LED uses around 5mA, so in short – I will run out of space and LED’s before I run out of power. But, we should limit each decoration to ca 250mA max – I will probably need far less.